Between Fact and Fiction: House Of Ivy & Sorrow Cover Reveal + ARC Giveaway! Eeeeeeeeeeeeppppppppp! This cover is so pretty!!! Ivy illustrated text and the colors, oh the colors! And of course, that blurb. So happy for you that you got this AWESOMESAUCE cover! I'm from the Philippines but if this is US-only, it's fine! You deserve hearing my "eeeeeeeeeeeeeeeppp". Hee! I LOVE the cover, and the book sounds amazing, So excited for you. squeeeeeee! Wow, very nice cover, congratulations! I didn't realize you had another coming out so soon (yeah, almost a year away, but still). Way to go! Wooooow!!! This book looks SO awesome!! Can't wait until it's out! So pretty! And the book sounds fantastic. Can't wait to read it! This cover is gorgeous and I loved Transparent! Can't wait to get my hands on this! Ooh, I love your covers! Transparent's sitting on my desk, all pretty and mellow, and House of Ivy and Sorrow looks amazing as well! You drew the lucky sticks for covers. Love the cover! Can't wait to read this. Thanks for the contest. Eep! It's so prettyyy! Love it! I seriously can't wait to read this. :) Thanks for the giveaway! Oh wow, that is one er pretty cover!!! Love it. Writers get to deduct that $10 as a business expense, right? That is just about the prettiest text art I have ever seen on a book. I just want to reach out and touch it! Also I love books about witches and it sounds like a great twist on them! Ooh! The cover is super pretty! I'm really exited to read the book. Squee! Love the cover, love the blurb, can't wait for this book! Congratulations! This is such an amazing cover! Love it soo much! Oooh, pretty! I can't wait to read it! Oh my gosh. I love it. I love it so much. I love that cover, Natalie! It's gorgeous. Natalie!! It's perfect. I've been dying to read this one since you posted that little chapter snippet like years ago. WAHOOO!!! I want one! Me! Over here!!! Beautiful cover, with the font and the ivy and everything! Beautiful front page, beautiful concept, PUDDING!!! And magic! Talking cats, like in Miyazaki/Studio Ghibli movies! And all those fantastic internal themes/thoughts/emotions that mean a lot to people! That cover is beautiful! I'm going to go back and have a moment with it! I cannot wait for this book. Love, friendship, family...all important themes. So excited for you, Natalie! Amazing giveaway and synopsis! It sounds awesome! And the cover is so beautiful! I LOVE IT!!!!!!!!!! Seriously everything about this book screams love to me! I'd love to win a copy! Ooh, I love this! Love the twisty words of ivy! Love, love, love the cover! And WITCHES are one of my favorite things in books. I need to write a story about a witch one of these days. So very excited to read it! Love this cover. It will really stand out on the YA shelves. Congrats!! This cover. THIS COVER. Honestly it is beautiful! Lovely! Also, I think more books should debut in paperback--then I could afford to buy MORE BOOKS!! WOW! This cover reminds me of The Chaos of Stars - with basically just typography/letters! I love it! It's creepy and haunting and fantastic all at the same time! I haven't read a witch story in a long time - so I'm excited to see what you've come up with! Congratulations! The cover is lovely. The cover turned out awesome! Thank you for giving us a chance to win an ARC! The cover is beautiful and the premise/story sounds intriguing. Thank you for the opportunity to win an ARC. Sounds really interesting and the cover is beautiful! Love, love, love your cover! And the story sounds awesome: witches, talking cats, kisses, and curses <-- count me in! Congratulations on your gorgeous cover and upcoming book! Love the book description, witches are always a favorite topic of mine! And the cover is really pretty. Excited to read this! Gorgeous cover!!! You hit the jackpot with that! Gorgeous cover, and sounds like the story matches! Adding to Goodreads now! Soooo pretty!!! Congrats! I can't wait to read it! It's beautiful! And green! I love green! It's so lovely! I don't know what I was expecting, but the font-centricness and literary feel of the cover (it just screams "literary!" to me; I've probably seen a litfic cover like it before, but who cares?) is perfect. Looking forward to reading it! LOOKS GORGEOUS!!! :D :D :D :D Omg so excited :D *SQUEEEE!!!! * Thanks so much for the amazing giveaway!!! Honest to goodness, I got shivers reading the first line of the back cover copy! Can't wait to read it! So excited I loved Transparent and have become a huge fan of yours. The cover is gorgeous and I will defiantly be reading it!!!! Congrats on the beautiful cover!!! XD It looks like very intricate needlepoint - absolutely gorgeous. I LOVED Transparent (especially your writing style), so I'm really looking forward to this book! Oooh... I like it! Can't wait for this to come out. Congratulations! This looks amazing! I'd love to read it. You know how much I LOVE this cover!! (and this book!) So excited for you!! I love the cover! I'm really liking the recent typography cover trend, and this is one of the best yet. Can't wait to read it! OMG! I can't believe HOUSE OF IVY AND SORROW is, like, finally legit!!! I found your blog around the time you were doing sketches of Jo just for funzies. And now look at you go, Natalie. I'm so proud and honored and on the edge of my seat--- can't wait! Warmest wishes and congrats on the faboo cover! Wow, what a great cover! I think even if I didn't know what it was about this one would have caught my eye. I hate to sound completely vain but the cover art makes a difference in piquing one's interest. Would love to read it! :) Thanks. The cover is beautiful! Simple but still very pretty :] And it's about witches?! I'm starting to get into every type of supernatural being now, vampire, werewolf, angels, and witches. They are all interesting and amazing that I'm pretty sure House of Ivy and Sorrow is too! Love the cover - it would definitely catch my eye if I were browsing through a bookstore, and the back cover description would seal the deal! I really look forward to reading this book, thanks for the opportunity to win a copy! Oooh, I like it! Text-focussed covers are already a favourite of mine, but the colours seal the deal. I don’t know what it is about them, but the slight gradient in the letters and the combination of both colours really catch my attention. This is such a beautiful cover! CONGRATS! I love the colors and I'm a sucker for type-heavy covers. Also, thanks so much for the giveaway! Oh. My. Goodness. This is spectacular! Probably one of my favorite covers of 2013! I'm definitely a to typography kinda girl, so I love love love this cover! And pudding? Um, so excited to read this! Thanks for the giveaway! LOVE LOVE LOVE!! Can't wait for this book! I'm SO glad you got a good cover. Congrats! It's so pretty! The cover is so pretty. I can't wait to read this! I LOVE your book cover. So cool to see your name on a cover of a book, I am so happy for you. Would love to win an ARC on the 24th of June, cause that is my birthday. Hoping my birthday luck will win me a copy of your book. Very, very awesome. I love how the title sorta just seems to float up to you. It reminds me of those pics where you had to sort of unfocus your eyes to see the image that was hidden within(can't remember the name of those...) But congrats, can't wait to read it! This cover is simply amazing. I love how it looks like the words are growing out of ivy. I just read the blurb on Goodreads, and it went right on my wishlist. Thanks so much for sharing this, and for the AMAZING giveaway! Count me in! The title alone is stupendous, and the design team certainly outdid themselves. Can't wait to read! SO. MUCH. PRETTY. The book sounds amazing!! The synopsis reminds me of We Have Always Lived in the Castle by Shirley Jackson. How fun! Gorgeous! I am especially excited about the pudding. LOVE THIS SO MUCH. And this book sounds right up my alley. Can't wait. Come, tax day, come! Yay! It's so pretty!! It will have a home on my shelf right next to Transparent, and enjoy the southern sea views and daydream about visiting the beaches on Kangaroo Island. Congratulations!! I shall dance prance around like an idiot with you! Such a beautiful cover! And witches!!! April 2014 seems so far away but congratulations on the beautiful cover! Beautiful cover! Can't wait to see it in person! Oh, I love it! I'm so excited for this one to release. I would LOVE to be able to read it early. Thank you! And congrats on the pretty! Natalie your cover is GORGEOUS!!! To die for gorgeous!! I'm not officially entering since I fully intend to beg Harper for one of these, but I had to tell you how fabulous it is! Sweet cover- and even better synopsis! Can't wait to read it! Congrats, Natalie! It's a gorgeous cover and an awesome premise. The cover is amazing - I love it! And that synopsis is so tantalizing...I've had this one on my "to-read" list since it was added to Goodreads, haha! Oh man this one sounds good! That cover is GORGEOUS!! I bet it's going to look amazing in person. WOW! I love the illustrations on the cover! Pick ME! That is a truly amazing cover. I would love to read it! Gorgeous! I can't wait to read it! Natalie! I about died when I saw the cover this morning, and NOW I've read the description! My anticipation levels just skyrocketed. Is it next April yet? Whoa tough competition ahead of me lol but I believe in trying and trying until I succeed which is the same mantra I say for this crazy journey of writing, querying, anyways enough of me...your cover SWOOOOOOOON I also love the premise and due for a witch story lol crossing my fingers and wishing you so much success. The cover reminds me of a cool blanket my grammy crocheted me about 5 years ago. The background is dark and mysterious, but the words don't make it over the top YA-spooky-teenage-angst-obscure that everyone is designing. I generally like it. Great job to the design department. That cover is amazing, I love the colours, and the font, and... it just looks awesome. The blurb sounds fantastic too, can't wait to read it! Oh, wow! This is a dream of a cover! THE COVER LOOKS AMAZING! Congratulations! And this book sounds EXACTLY like my cup o' tea. :) I already added it to my goodreads to-read and to-buy list and now all that's left to do is wait. And wait. :| Why, oh, why must the release date be so far into the future? Ahhh, this sounds like an amazing book! I can't wait to read it!! This cover is absolutely stunning! Can't wait to read it! I would love to read this ARC! The cover is amazing and honestly, it is what directed me to the book and sparked my interest. I look forward to reading this. Great cover! I look forward to its release. I saw this cover on Tumblr and thought it was absolutely BEAUTIFUL. Then I read the summary and fell in love. Late to the party, but boy am I glad to have my internet back. This cover is gorrrrrgeous. And the description mkes me want to read it NOW. I glad I read this just in time. I would love to win an ARC. I just finished reading Transparent and it was phenomenal. 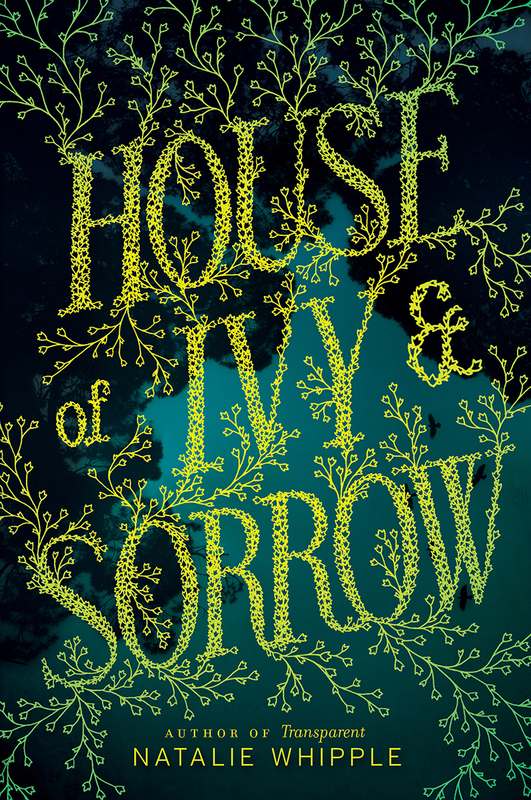 If House of Ivy and Sorrow is half as good, I'll be very glad to have an won an ARC!! This cover is AMAZING! I expected great things after you shared the beautiful artistic touches and typography from the opening page, but this is beyond-expectations-stunning. I'm doubly excited for this book to come out now. Congrats on scoring such a great cover, and thanks for the giveaway! Love, love, love this cover and would love, love, love to win! Congrats on the beautiful cover. *I* might pee my pants in excitement like those yippy-dogs because House of Ivy and Sorrow looks like it'll be ridiculous amounts of fun, heartbreaking and awesome! Ah! So exciting!! I want in! I can't wait to read this book. It's getting hard to find decent and thrilling witches and wizards and magic books these days but this sounds really interesting. That is easily the most gorgeous cover I've seen this year. So much pretty. I love the title of this book so much. Why is next April so far? Loving all the green. Beautiful!